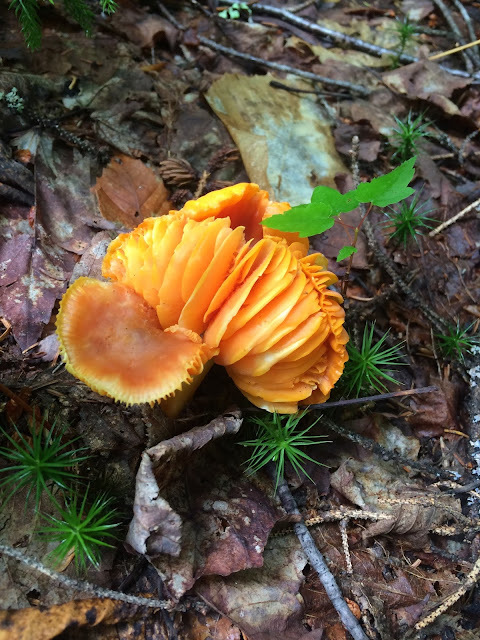 Not too long after our trip to Appalachian Mountain Club Cardigan Lodge in New Hampshire last summer, I wrote about a pond study activity in which we participated. We also completed two hikes. The first of these hikes was to Welton Falls in Welton Falls State Forest. My husband described this hike as short but he had never completed the trail with young children. To their credit, the children did very well and were encouraged by gummy "trail bears" along the way. One thing my children enjoy is digging in the dirt especially when it is at eye level. How do you accomplish that you ask? Well, look for upturned trees in the woods. We found one on the waterfall hike and another on our hike the following day. The children also like to hop on rocks, and the trail accommodated this type of play with many, many rocks. Once we arrived at the waterfall, the brave among us waded into the frigid pool of water at the base of the fall. I sank my toes into the very cool sand. We people watched, ate a small snack, and collected "fools gold" some of which I occasionally find in pant and bag pockets. The second hike - the Woodland Trail - was much longer. We knew this ahead of time but since the children had done so well on the waterfall hike we figured they could handle a longer one especially if we used a stroller's pace and packed a big lunch and snacks. The "trail bears" also made multiple appearances on this hike. There was plenty to fascinate young children. One the first gems we came across were ant-filled logs. The children used small sticks to manipulate the ants. It took some convincing to keep moving. We next encountered a stream which both children clambered down to before crossing a wooden bridge. This next section of the trail was a bit of a scramble over wet rocks and gnarly roots. When we reached the next plateau we were a bit spent. The hiker ahead of us was on his way to the summit. This was not our ultimate destination but even it were our party would have not taken his route which though the shortest way to the mountain top is the most difficult. At this point we dropped our pace. We meandered on the moss covered ground occasionally walking across boardwalks installed over wet ground. The landscape at this point on the trail was my favorite. The children found there upturned tree in this stretch, too. I observed many fungi and logged them on iNaturalist. We even spotted an Eastern Newt. The next phase of the trail was steep, downhill, and muddy but at the base the children were treated to a stream. My daughter found a stick twice her height and was smitten. The last stretch of the trail was almost overwhelmingly buggy and we were quite tuckered at this point. Our group split up so that my son and I could make it back to the lodge for the pond activity. My husband and daughter joined us later. In addition to activities in and around the lodge, we went blueberry picking at Cardigan Mountain Orchard (not affiliated with the lodge), ate ice cream at The Mill Ice Cream Cafe & Fudge Factory in Bristol which overlooks the Newfound River, and on our way back home swam and splashed around in Newfound Lake. We all want to return to Mount Cardigan this summer!